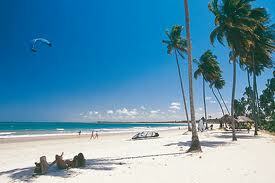 Salvador Brazil is the capital of the Northeastern state of Bahia. People also call it the capital of happiness of Brazil. That's because the people are very mellow, and there are lots of outdoor parties. 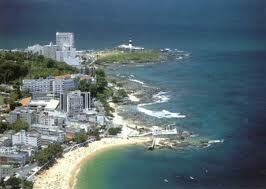 That's made Salvador de Bahia a very popular tourist destination. When you visit the area, there are 5 things that are not to be missed. Elevador Lacerda. This is the largest landmark in Salvador. It's in the same place as the first rope and pulley system that the Jesuits installed more than 400 years ago. It is the fastest way to get up and down between the Upper City and the Lower City. It takes about 20 seconds to go 70 meters. It's also a great way to a good view of the city and harbor. Over 50,000 people take this elevator daily. Farol da Barra. This is the Barra Lighthouse. It stands on the same site of the Forte de Santo Antonia da Barra. The fort was the first fort built by the Portuguese to protect Salvador Brazil from foreign attacks. There is also a museum on the grounds. The museum houses artifacts found from shipwrecks in the bay, as well as other naval things. It's also a good place to sit and watch the sunset. Historical City Tour. Take a walking tour around the historical district of Salvador Bahia. Among other things you will get to see the Teatro and Bale de Castro Alves. Your guide will be familiar with the history of this town, and will tell you everything you want to know. Schooner Trip to the Islands in All Saint's Bay. You don't want to visit Salvador Brazil and not spend time exploring Baia de Todos Santos. The bay is very important to the area. Take a sailing trip on a schooner, and enjoy sailing the way it used to be. Ilha dos Frades and Itaparica are in the bay, and the perfect place to swim, snorkel, go horseback riding, and relax on the beach. This trip will take up your whole day, but it will be a highlight of your trip. Mercado Modelo. This covered market was built in the 1860s. It was originally built to act as a custom house. It was rebuilt in 1984 because of a fire. It has 250 stalls. It is the place to go in Salvador Bahia for Brazilian arts, crafts and souvenirs. You can even watch capoeira demonstrations. That is a martial art that was developed in Brazil. It is done to music, and looks like dancing. It looks like dancing because training to fight was outlawed, and this was a way that the men could train without getting arrested. If your itinerary includes a stop in Salvador, make sure that you check these places out. You will be glad that you did.